The Footboard Bench is extremely useful for a variety of tasks. It's perfect for a dressing bench, a trunk top for bedding overflow, or to store extra items. Available in a selection of finishes corresponding to the frames available. 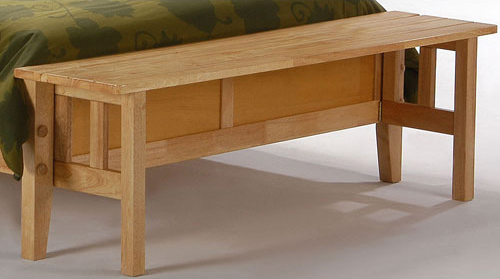 The footboard bench replaces the existing footboard. If you order this item at the same time as a Sonata bed frame we can give you a $25 discount on the frame and eliminate the footboard. Please email us for details. � Available in cherry, Medium oak, java, white, and natural finishes. We ship your footboard bench via UPS Ground with tracking. Most orders ship out within 24-48 hours.